The Parador is located below the cathedral near the border river in Tui (Tuy) in Galicia. 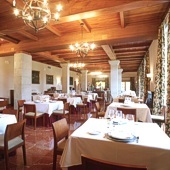 The Tui Parador has granite walls and chestnut wood on the floors, ceilings, beams and staircases and is a recreation of the typical Galician country houses. The comfortable bedrooms are decorated with soft shades and rustic furniture achieving a friendly and peaceful atmosphere. Outside is a splendid swimming pool and a beautiful garden. The food in the parador restaurant is a mix of international dishes and Spanish dishes, There is also a special gluten free menu. Take a walk uphill and visit the cathedral, the churches of San Bartolome, San Francisco, San Telmo and the Bishop's palace. The festivals of Tui worth visiting are Carnival on Shrove Tuesday, San Thelmo's day on Easter Sunday and the Tui Eel festival on the: 1st Sunday after Easter. In August there is the international canoeing descent of the Mino river. Explore by car the Natural Park of Monte Aloia or go down river to see the prehistoric settlement on Mount Santa Tecla, For a summer days outing, go by ferry from Vigo or Bayona to the Iles de Cies (Islands of the Sky) and walk through the camp ste and have lunch at the bistro near the end of the beach. Reception can arrange bicycle rides, four wheel drive safaris, pony trekking, flying in a hang-glider or microlight, canoeing, rafting or water skiing, Or you can swim or play tennis at the Parador. 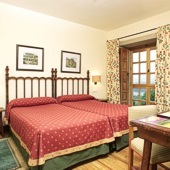 The Parador of Tui has fourteen twin bedded rooms, fourteen rooms with a double bed, three suites and one easy access room. In the rooms there is air conditioning, telephone, satellite television, TV canal plus, safe and a mini bar. The Parador has central heating and air conditioning, currency exchange, lift, free internet access in communal areas, parking facilities (without security and limited places), satellite television, gift shop, restaurant (Gastrobar), bar and facilities for the disabled. Other facilities include a garden with children's playground, tennis court and a seasonal swimming pool. Distance from the nearest airport is approximately 25 kms, train station is 5 kms away and the nearest port is 30 kms away. If you don't enjoy staying at the Parador in Tui, you are unwell. Seek help. Lovely place and great staff but watch out for that clock across the river. Chimes and plays tinny music every quarter of an hour throughout the night and spoiled our night's sleep. If possible, try and get a room away from the river. Subject to the caveat below, we enjoyed our stay at this parador. The food was good and the staff were friendly. The views across the river are stunning. Tui is a lovely town and a great place to wander around and explore. The cathedral is well worth a visit. But, and it's a big but, we did not sleep at all well. The foor boards in the room above were also our ceiling and as there appeared to be no carpets we could hear every footfall only too clearly! The family (there were several of them) went to bed late and noisily. In addition the clock in the church across the river struck noisily every quarter of an hour throughout the night and as it's in Portugal, it was on a different time to ours! For these reasons we would not stay here again. What wonderful culture, cuisine, hospitality, comportment, manners, views, the list goes on. A really great stay had by all, thank you so much. So often one goes away on holiday and is disappointed by something; we were truly happy with everything and relish our return. 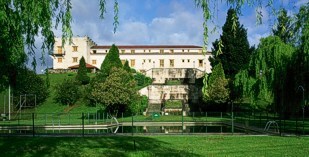 Parador de Tui in a typical manor house of Galicia now converted into a four star hotel.